North America Forum»Forum ›League of Angels ›Support › Recharging Limit via Paypal? Is there a limit on how many times or how much I can recharge a day? 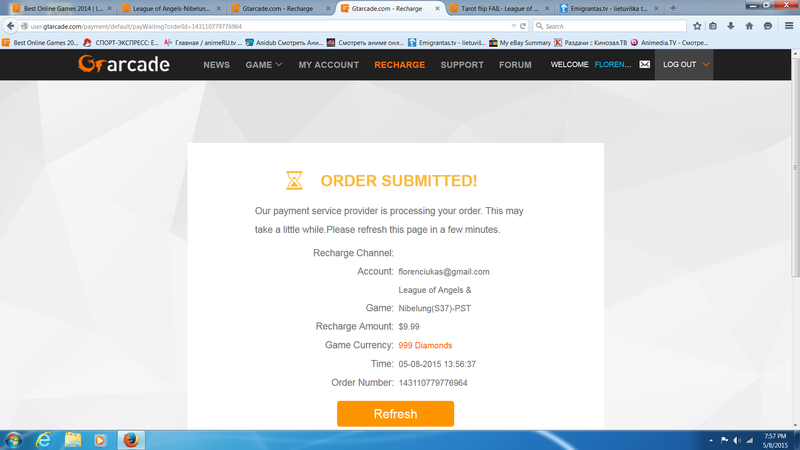 I recharged the first time, via Paypal, for $39.99 for 4,000 diamonds but forgot to activate Diamond Foundation. I tried to recharge again for the same amount, $39.99 via Paypal but failed.Is there a limit on recharges a day? I tried it 3 times yesterday and failed. Tried it again today and still failed. Am I limited to 1 recharge via Paypal only? I already send a ticket about this but got no reply. I have other tickets which was posted since April 16, 2015 and still no update. I wonder if they check tickets at all. I will make a report about this issue, however I remembered before that there is a limit in recharging process, that might be the reason. Please wait , will update your issue asap. In need your IGN and server. Kindly send it now. ;;;; I will make a report about this issue, however I remembered before that there is a limit in recharging process, that might be the reason. Please wait , will update your issue asap. Payment companies have set these limits as part of their risk control in payment. It\'s normal. If you have any other issues please don\'t hesitate to post it in support section. Thank you. Hello. Yes i have; problem with PayPal. it already 3 day. Dont get my make payments !!!!! Showing this window in your site !!!! 2019-4-20 04:59 GMT+8 , Processed in 0.063254 second(s), 46 queries .